To lure buyers, Peugeot is counting on an exterior design it calls "French chic" for the 508. ALICANTE, Spain -- Peugeot is counting on China and growing demand for station wagons in Europe to help make its new 508 large car a success. In the past 10 years, European buyers have shunned large cars made by volume brands in favor of premium sedans, wagons and SUVs from BMW, Audi or Mercedes-Benz as well as SUV-styled crossovers with a high riding position from mass-market and luxury carmakers. But Peugeot believes the segment has potential. "After 10 years in decline, the segment has consolidated and may grow again on increased demand for wagons," said Laurent Blanchet, Peugeot's director for upper-segment models, at the 508's press launch here. Peugeot expects half of 508 sales to come from the station wagon variant, with three quarters of the volume coming from fleet sales to business customers. The model replaces two slow-selling Peugeot cars -- the 407 mid-sized car and the 607 large sedan. The mid-sized segment is dominated by German cars such as the Volkswagen Passat and in developing the 508, Peugeot benchmarked German premium brands for quality. Blanchet said the brand surveyed German dealers and customers to analyze their demands. A demand for improved seating comfort and better quality that improves the car's resale value were some of the findings. 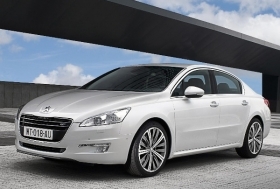 Peugeot also focused on measures to improve fuel economy for the 508. Despite being 100mm longer than the 407, the 508 weighs between 35kg and 40kg less, depending on body style and equipment. The car has French supplier Valeo's second-generation stop-start technology that has lower operating temperatures and early engine stoppage at speeds of less than 8kph. "We found several kilograms of weight savings all over the construction," Blanchet said. "Turbo impellers are made of titanium and we have reconstructed the front-end safety structure and applied new materials all over, including aluminum for suspension parts." The most efficient 508 with a 1.6-liter diesel engine has CO2 emissions of 109 grams per kilometer. A 508 with a diesel-electric hybrid powertrain is also planned. Peuegot says the diesel hybrid will be the greenest large car in Europe, with average CO2 emissions of 99g/km. The 508 is built in Rennes, France, and will also be produced and sold in China starting in July as part of Peugeot's plans to boost sales in the world's largest car market.